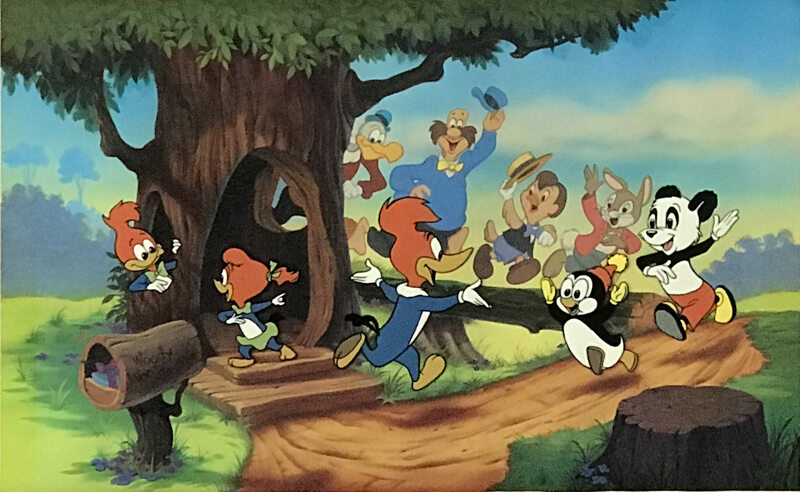 Hand-Painted Limited Edition Cel of Woody Woodpecker as he Greets his Pals, Knothead, Splinter, Chilly Willy, Andy Panda, Oswald Rabbit, Homer Pigeon, Wally Walrus, and Buzz Buzzard. #281/500. GRACIE’S GUYS & GALS 1992 Walter Lantz Signed Limited Edition of “Gracie’s Guys & Gals.” #62/100. A tribute by Walter Lantz to his wife, Gracie who was the voice of Woody Woodpecker as well as the other characters seen above. This is the last one we have and it’s very difficult to find. 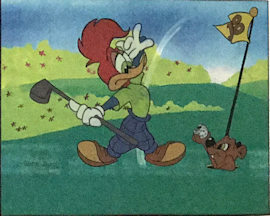 WIND UP 1992 Walter Lantz Signed Limited Edition Cel of Woody Pitching. #19/200. Original Hand Painted Background Title Card entitled “Drooler’s Delight. This was a Woody Woodpecker cartoon. Signed by Walter Lantz and bears the Walter Lantz Productins stamp. DESERT OASIS 1950’S Walter Lantz Background Layout Drawing of a Desert Oasis. 1950’S Walter Lantz Background Layout Drawing of an Amusement Park Roller Coaster. B.F.I HEADQUARTERS LAYOUT 1950’S Walter Lantz Background Layout Drawing of BFI Headquarters. BATHTUB LAYOUT 1950’S Walter Lanz Background Layout Drawing of a Resplendent Bathtub. BATS IN THE BELFRY 1960 Original Walter Lantz Studios Background Layout of a Police Photo of “The Bat.” Prod. #U-32, Sc. #13. BUZZ BUZZARD 1950’s Production Cel of Buzz Buzzard on a Walter Lantz Stamped Production Background. DESERT LAYOUT 1950’S Walter Lanz Background Layout Drawing of a Tent in the Desert. Very Nice Rendering. Blue Pencil on Animation Paper. DESERT VILLAGE LAYOUT 1950’S Walter Lanz Background Layout Drawing of a Desert Village as seen from a Distance. Graphite on Animation Paper. HOUSE INTERIOR LAYOUT 1950’S Extremely rare Walter Lantz Background Layout Drawing of the Interior of a House Which has been Wrecked. LITTLE ESKIMO BOY 1930’s Walter Lantz Production Cel of the Eskimo Presented on a Watercolor Production Background. SLEEP HAPPY 1951 Animation Layout Drawing of the Title Card for the Woody Woodpecker Cartoon. Brown Pencil on Paper. STAGECOACH LAYOUT 1950’S Walter Lantz Background Layout Drawing of a Stagecoach. Yellow, Green, Red and Blue Pencil on Animation Paper. SUGARFOOT 1950’S Walter Lantz Background Layout Drawing Showing Sugarfoot’s Bed. TRACTOR LAYOUT 1950’S This is a great Walter Lantz Background Layout Drawing of a Tractor at a Drive-In!! Blue and Red Pencil on Animation Paper. UNKNOWN 1952 Huge Pan Background Layout of a Street Scene with Fruit Stands and a Dress Shop. Prod. #U-14, Sc. #15. WOODY LAYOUT SC 45 1951 Animation Layout Drawing of Woody Woodpecker’s Tree, Door & Snow-Covered Tree Limb. UNKNOWN 1950’S Pan Background Layout of a Bazaar in a Village. UNKNOWN 1952 Pan Background Layout of a Wooded Area Which Has Been Partly Cleared to Make a Road. Prod. #U-18, Sc. #19 & 41. WOODY LAYOUT SC 47. 1951 Animation Layout Drawing of a Snow-Covered Cabin in the Woods. From the Same Production as 1854-WL. WOODY WOODPECKER 1972 Animation drawing of Woody Woodpecker and the little dog on a seesaw. Walter Lantz Sericel of Woody Woodpecker Golfing with the Gopher. WOODY WOODPECKER 1953 Pan Background Layout of the Entrance to a Harem. Prod. #U-28. 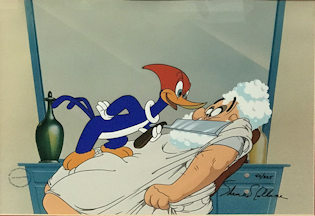 WOODY WOODPECKER 1972 Production cel of Woody Woodpecker and the little dog on a seesaw. Signed by Walter Lantz in faded marker. WOODY WOODPECKER 1950’S Walter Lantz Background Layout Drawing of the Christmas Tree. Blue Pencil on Animation Paper. WOODY WOODPECKER 1950’S Walter Lantz Pan Rough Background Layout Drawing of a Roller Coaster. WOODY WOODPECKER 1950’S Walter Lanz Background Layout Drawing of a Battered House from a Woody Woodpecker Cartoon. WOODY WOODPECKER 1950’S Walter Lanz Background Layout Drawing of an Amazingly Long Table in a Great Dining Hall. From a Woody Woodpecker Cartoon. WOODY WOODPECKER LAYOUT 1950’S Background Layout of a Town as Seen Through an Archway. Hand-Painted Limited Edition Cel of Woody Woodpecker Signed by Shamus Culhane. #42/325. Overall Size 12 1/2 x 16 Inches.